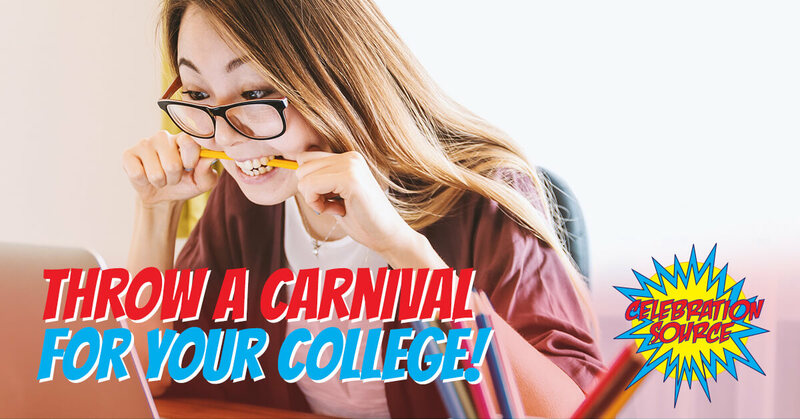 Throw a Carnival for Your College! While college is a special time for young adults to find themselves, new friends, and possible career paths, it also comes with its fair share of stress. While trying to enjoy a budding social life, students find themselves simultaneously struggling to juggle exams, essays, jobs, finances, and other pressures that serve as a wakeup call into adulthood. But it’s important for them, as it is for everyone, to take a breather every once in a while and let their inner child loose. At Celebration Source, we’ve proudly been providing party entertainments right here in West Miami for children and adults alike! While some students might initially scoff and proclaim that they’re too old for carnivals, we promise that their apprehension will subside once they catch the irresistible smell of cotton candy and funnel cakes wafting through the air and hear the shouts of elation from fellow students playing carnival games. Whether you’re looking to throw an event for homecoming, fundraisers, Greek events, or just to break up the monotony of class, consider letting us bring the carnival experience to your campus! Here are just a few of the things that we’ll provide at your next college event. Although college students have likely outgrown our Go-Gator Roller Coaster, they’ll never be too old for our other carnival rides. 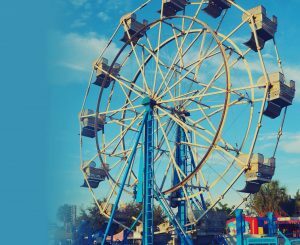 Whether you want to go with the classics (we’re proud to have the only 50-foot Ferris Wheel in South Florida available year-round), or looking for something a little more exhilarating like our 100-foot Zip Line, we guarantee you’ll find the right rides for your campus. Have your students take a break from the ramen and pizza diet, and have them put something good into their bodies, like cotton candy and popcorn! Okay, we understand that our carnival food isn’t very nutritional, but don’t tell us it’s not delicious! Look through some of the foods that we provide and just try not to drool at the images. Nothing brings students and faculty together quite like a healthy dose of competition! We have an array of outdoor and indoor party games that will guarantee to put a smile on every attendee’s face. Have the students race each other on the Log Roller, or see how high they can climb on our rock wall! We’ve got it all! Be sure to browse through our party games to find the right options for your college event. If we haven’t sold you to the idea of a carnival party for your campus yet, make sure that you check out our selection of inflatables! From epic inflatable water slides to interactive games, we’ve got the best collection in all of Florida. Are you looking for a more low-key event? How about our movie night? Our movie screen is the perfect way to get everyone together and enjoy a good flick outside. Here at Celebration Source, we’re proud of our vast collection of all things fun! We promise you that the students at your college will not forget carnival night and will ask to make it a tradition. If you want us to bring the party entertainments to you, be sure to contact us now for a free quote!